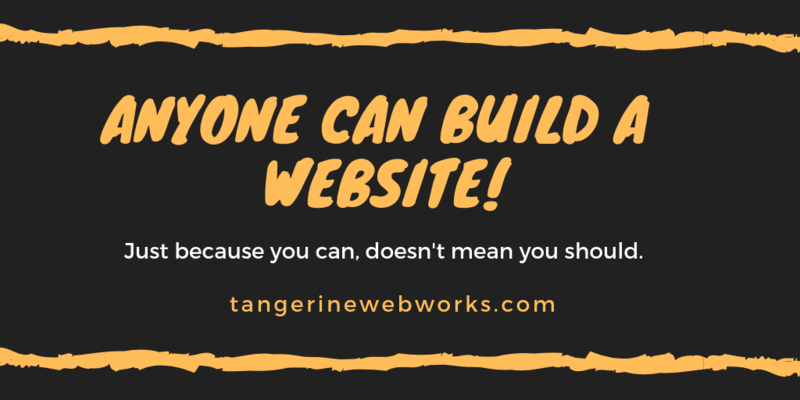 Tangerine Web Works | Anyone Can Build a Website! Whenever I hear someone say, “Anyone can build a website,” it reminds me of years ago when digital recording was first hitting the mainstream. Suddenly, people thought, “Anyone can record an album.” All you need is a computer and software, right? No musical talent? Just use someone else’s music. No singing voice? Auto-Tune is your friend! Within a few years, there were millions of people making “albums” that no one wanted to hear. Today, we have another case of the skewed perspective spreading like a wildfire. Platforms like GoDaddy and Wix spend millions advertising how easy it is to build a “stunning” and “beautiful” website. If you’re an amateur or craftsman who simply wants to share your work, building a basic website can be a justifiable DIY project. If, however, you are a serious business owner or non-profit director looking to grow your business or expand your outreach, you will find yourself at a serious disadvantage. Unless you have a true eye for design, stellar writing skills, marketing knowledge, expertise in search engine optimization, and enough coding competency to modify a template, you should hire a pro. An experienced consultant can offer valuable input when it comes to strategy and goals, in addition to web design and development. Number 1: Great copy that converts. In sales, fundraising, or SEO, content is still king! Number 2: Search Engine Optimization that gets you seen. People won’t buy your products or services if they don’t know you exist. It’s amazing that so many people ignore those two vital pieces of the puzzle and go for the “free” dangling carrot. Late last year, I reached out to a small non-profit to offer my services and the co-founder said, “We’ve never spent money on a website.” Well, believe me, it showed! I tried to explain to her that minimal changes — like fixing the glaring typos and cleaning up the amateurish layout — would substantially increase donations. She said she’d think about it. The last time I checked her website, she hadn’t even corrected the typos. Maybe she doesn’t want to increase donations and feels there’s more honor in scraping by. Maybe she just doesn’t care. Many non-profits seem to have a similar mindset: “We don’t want to look like we have money.” (Someone actually said that to me.) Maybe that mentality worked in the past. I can see how a sad-looking website might have encouraged people to give money to a cause in the low-tech, pre-smartphone days. But, it’s a different world now and folks are much more savvy. They’ve seen enough websites to know what’s worth their attention and what’s not. People won’t fork over hard-earned cash to an organization that looks poorly-run. And, trust me, nothing makes you look more poorly-run than bad copy and half-assed layouts. As a charity organization, it behooves you to create the most pleasant donor experience possible. Especially, if it results in a 100% increase in donations. The same goes for the small business owner. If an optimized website brings you 3-5 new customers a month, what would that do for your bottom line? Depending on your industry, your revenue could increase 10-30%. Paying for a professionally-developed website is an investment that can bring you quantifiable returns. If your goal is a great website that yields a great ROI, it’s in your best interest to find a pro that you can work with. You will see tangible results in the form of more customers, more donors, and increased visibility. Sure, anyone can build a website. But it takes skill, knowledge, and expertise to build a successful website that gets results.